The rare first collection of Eugène Valmont mysteries, the most successful literary French detective of his era, and the first in a long line of humorous detectives. Created not by a French writer but by a Scotsman who had grown up in Canada and returned to the UK to forge a literary career, founding the The Idler magazine together with Jerome K. Jerome in 1892. Although Robert Barr’s Eugène Valmont has Sherlock Holmes like qualities, he is ‘a much more tongue-in-cheek creation’. ‘The title of the book seems ironic. We see very few of his triumphs. The very first story explains why he has had to leave France to avoid becoming a laughing stock and, in the rest of the tales, he fails far more often than he succeeds. Yet none of these setbacks ever daunts him or dents his supreme self-confidence. ‘I have had my failures of course,’ he acknowledges but he remains a happy egotist. Whether dealing with a gang of anarchists in ‘The Siamese Twin of a Bomb-Thrower’ or flirting with the supernatural in ‘The Ghost with the Club-Foot’, his sense of style and his almost Poirot-like conceit never desert him.’ (Nick Rennison, from the preface to the Gaslight Crime edition). It appears this ‘First Colonial Edition’ was published by George Bell in 1905, the year before the ‘First Edition’ of Hurst & Blackett. The adverts include are dated July 1905 and September 1905. 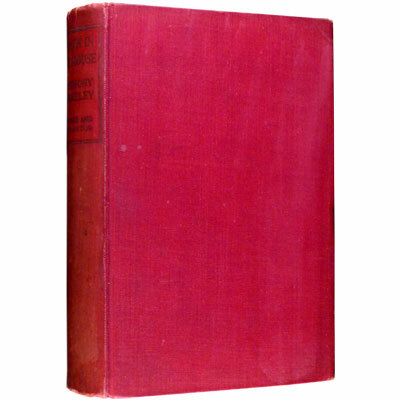 Although it contains the same short stories, the titles and chapter headings match those of the 1906 American edition, and those of the original stories printed in in Windsor Magazine and Pearson’s Magazine in 1904-5. A fine example, featuring Inspector Littlejohn of Scotland Yard. The true first edition with publisher's name to title page (Book Club editions stated 'Thriller Book Club Edition' as publisher to title page instead of Gifford), and in the elusive true first issue dust jacket with 'John Gifford' to the tail of the spine (the 'Gifford' lettering is covered over for the ‘Thriller Book Club’ dust jacket which used matching illustrations, but advertised other ‘Thriller Book Club’ titles, and did not have a price on the front flap.